We reach the mid-season finale with the eighth episode of the season, “Too Far Gone”. Humanity is an ongoing struggle in The Walking Dead. It’s important to maintain it but with time, harder to hold onto it. I think that is the core of tonight’s episode. Can we reach a point where someone is too far gone to be saved? It starts out with the Governor telling his group that they need to take over the prison to survive. There’s nothing standing between them and the biters right now. Not only does the prison have walls and fences to protect them but land they can farm. The plan is to take it as peacefully as possible but they have to be willing to fight for it if needed. He admits to taking two hostages which turn out to be Hershel and Michonne. They can use them as a bargaining tool. Lilly objects but the rest of the group agree to go through with it. Hershel attempts to reason with the Governor, suggesting that their groups cohabit the prison together. The offer is rejected. At the prison, we find the group recovering from the illness. Glenn teases Maggie about an upcoming anniversary and Sasha enters Bob’s cell to him for his help. He is reluctant to accept her gratitude at first, even downplaying his role in her recovery. 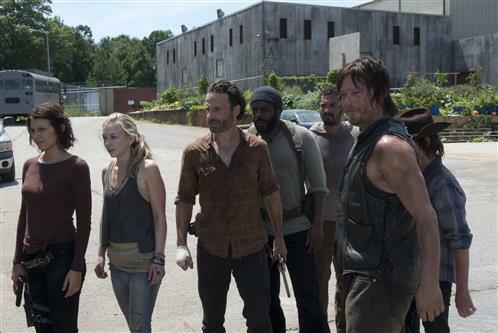 Rick and Daryl have a confrontation about Carol being left behind. Daryl is upset and questions if Rick really believes it was the right thing to do. Rick defends his actions. Carol killed two of their own. Out there, she at least had a chance to survive. The only other option was bringing her back to an angry Tyreese. The two come to an agreement that it’s time to tell Tyreese who committed the crime. He is upset at the discovery of a rat nailed onto a board. Someone has dissected it. He is concerned that it’s the same person that killed Karen and David but the conversation is cut short before Rick can explain, by the sound of gunshots outside. Lilly and her daughter opted to stay out of the fight, remaining back at the Governor’s camp. Meghan is still playing in the mud while her mother watches for biters. One appears to be making his way across the river, towards them. Meghan has found something in the mud and requests help with digging it out. Lilly dismisses it, preoccupied with the biter getting nearer. At about half way across, he falls into a deeper area of the river and the current pulls him away. The object Meghan found was a sign warning of Flash Flooding in the area. Unfortunately, the sign wasn’t the only thing buried there as a hand reaches out of the muck and grabs the child. Lilly rushes over but it’s too late. Meghan has been bitten! Back at the prison, Rick learns that it is the Governor behind the shots fired. He had arrived with a group of people, all armed and ready. To make matter’s worse, he had a huge tank looming behind him! He tells Rick that they need to talk. Rick explains that they have a council now, he doesn’t make the decisions anymore. The Governor asks Rick if Hershel and Michonne are members of the council. Alisha brings them forward to kneel in front of the Governor, with their hands behind their heads. He tells Rick to start making the decisions again. Daryl begins to distribute weapons among their own group and they prep up a van for evacuation if needed. Rick walks over to the fence to negotiate with the Governor. “You got a tank, you don’t need hostages,” he points out, hoping to get Hershel and Michonne free. The Governor ignores it, and gives them an ultimatum. They have until sundown to leave. Rick argues that it’s not possible. They have sick children that wouldn’t survive outside the prison. Like Hershel, he offers to share the prison. They could share live in different cell blocks and avoid each other until they came to an agreement. Once again, the Governor refuses. Rick delivers an ultimatum of his own: Everyone must live in the prison or no one can. The Governor grabs Michonne’s katana and walks over to Hershel, his intent clear. Rick begs them to put down their weapons and join them at the prison. He tells them to let it all go. That nobody has to die. They made it this far. No one is too far gone. Everyone gets to come back from their bad experiences, whatever they may be. Everyone can change. Hershel smiles. It seems his message has finally gotten through to Rick. “Liar”, the Governor says, bringing the sword down upon Hershel, destroying any remaining chance at peace. Both groups exchange gunfire, with Rick taking a bullet to the leg. Michonne breaks away, but the Governor catches up to a wounded Hershel, decapitating him. Mitch and Alisha join the fight but Tara refuses, choosing to run away instead. Lilly catches up to them, carrying Meghan in her arms. The Governor walks over and shoots the child to prevent her from reanimating. He and Rick end fighting. It seems like everything was for nothing but the battle continues on. The tank breaks its way through the two fences, leading what is left of the Governor’s group toward the prison. This buys Rick’s group some time to prepare. Though heartbroken over the loss of their father, Maggie and Beth work together to get Glenn and the other survivors to the bus. The children (the youngest with Judith’s baby carrier) are on their way to the bus when Lizzie stops them. She tells them that they need to join the fight. That Carol taught them to be strong. She and her child army arrive just in time to save Tyreese from Alisha and Jose. Bob takes a bullet but Sasha is there to help him. Daryl uses a walker as a meat shield and makes his way towards the tank. He tosses a grenade down the barrel to force the operator out. He greets Mitch with a crossbow bolt to the chest. Michonne comes to Rick’s aid, stabbing the Governor with her katana. He’s left to die while Rick limps off to search for Carl. After some initial concern, he finds his son alive and well. Together, they search for Judith and come across her empty carrier, stained with blood. By now, quite a number of walkers are in the area, leaving little to the imagination. “Too Far Gone” ends with Lilly making her way towards the Governor, who is now injured and crawling himself. She finishes him off with a bullet, bringing the war to an end. The camera pans out to show a large group of walkers closing in on the prison. One of them steps on the white king chess piece that Meghan had drawn the eye-patch on. Checkmate! I’d consider the mid-season finale an overall success! The Walking Dead certainly left us hanging and craving more. 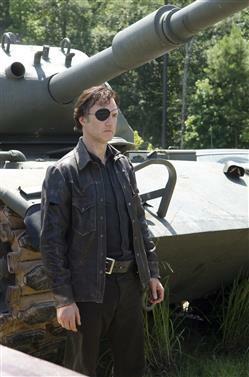 While some questions were answered and we have closure with the Governor’s story arc, there’s still so much going on. What will happen to the group? What exactly is inside Bob’s shoebox? Who is feeding walkers and dissecting rats? As trivial as it may be, my favorite part of tonight’s episode was watching Tyreese miss every shot. He was so bad with guns in the comic books but what he lacked in firearm skill, he made up for with tenacity and fists of fury! My least favorite part was saying goodbye to Hershel. He reminds me of my own father — strong, proud, willing to do doing whatever it takes to protect his family. Hershel Greene, you were the true king that fell tonight — you will be missed! What did you think about tonight’s episode? Head over to the forums and share your thoughts with us! My my. It was such an intense and disturbing episode, that I could only watch the last half in three minute takes and had to take a walk around the house! Hey hey, funny but true. The Walking Dead is actually quite profound on so many levels, speaking to us of many things beyond the shows central premise. Family, friends, survival, children, faith, living armed or unarmed in a world of wolves and murderous mindless mobs, realizing what is of real value and are you willing and able to stand up effectively and speak and act for all you love – and either triumph or vanish etc. TWD leaves most other shows in the apocalyptic dust of irrelevance and well, tedium. Then there’s The Walking Dead soundtrack, music and songs and not just of the great Bear McCreary. Ah, of course it’s the writing, direction, effects, location, source material and the outstanding acting and so much more and so on. The Walking Dead is simply essential viewing. No, really. Colonel Neville.